There are many weight loss myths out there. Unfortunately, many of them are not true. Here are five important untrue fat loss myths and the real truth about why they actually help you lose weight. Fruits and Vegetables. Yes, these are carbs. Eat them. So we’ve talked quality, now let’s talk portion sizes. 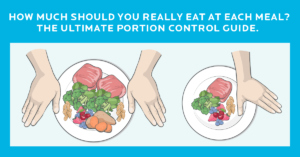 This awesome infographics from Precision Nutrition details what appropriate portions are for men and women. For men (left picture) you want two fists of lean protein with each meal and, two cupped handfuls or complex carbs, and a thumb of healthy fats. For women (right picture), you want one fist of lean protein, one cupped handful of complex carbs and one thumb of fat. Portions will change based on your body size, activity level and meals per day. In my opinion, the picture above is based on eating 3 meals per day for someone who is not trying to lose weight. If you eat snacks or want to lose weight, the above portions may even need to be decreased. 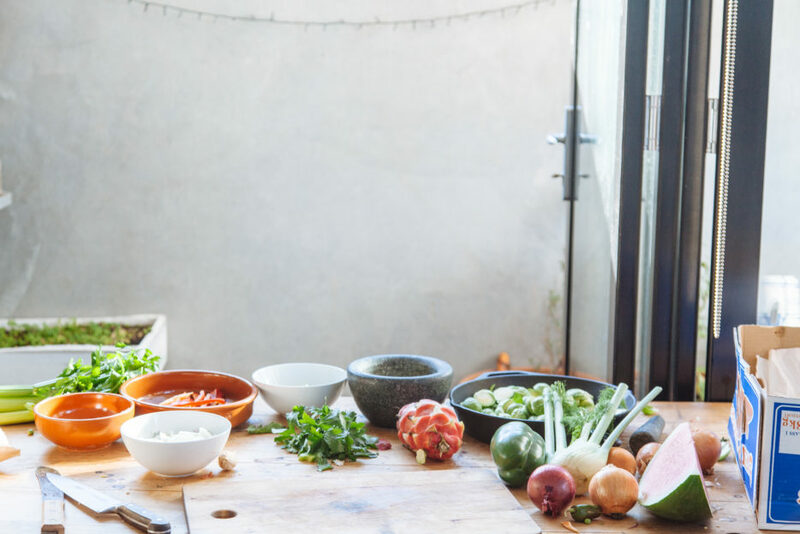 How can you tell if your portions are appropriate? Hunger level. A good rule of thumb is your bedtime hunger levels. If you are hungry an hour or less before you go to bed, you’ve put yourself in a calorie deficit. If you’re not hungry before bed or during the day, you may need to rethink your portions. You don’t need to do cardio to lose weight. There, I said it. In fact, you don’t even need to exercise to lose weight. Simply eat 500 less calories per day and change nothing else. You will lose weight. Will most of it be muscle? Yes. Intervals are an excellent way to burn fat and keep your body in fat-burning mode long after the workout. Longer duration cardio is great for overall cardiovascular health and can be a great source of caloric burn. However, most people tend to consume all the calories they have burned and then some preventing weight loss or even causing weight gain. If you like a certain cardio activity (running, cycling, rowing, rollerblading) keep doing it. For each extra pound of muscle, your body burns 5 calories per day. This seems insignificant. But If you were to gain 5 pounds of lean muscle, over the course of a year your body would burn an extra 9125 calories (unless it’s a leap year). This is about 3 pounds of fat loss just from resting muscle. This is without taking into consideration the extra energy it takes to carry around your newfound muscle. Seems like a good deal to me. The line between an appropriate calorie deficit and starvation is thin. In order to lose weight you need to eat less calories than your body is burning. It’s simple, but not overly simple. Create too deep a calorie deficit for too long, and a cascade of unfortunate events take place. Cortisol increases your bodies ability to hold onto fat. It’s a downer of a hormone. You don’t have the energy to do your high intensity interval training (HIIT). Let’s prevent this wretched hormonal cascade. Start out small. Do not drop your caloric intake more than 500 calories at a time. If you are currently eating 2500 calories per day, try dropping it to 2000 calories. Stick with it for 2 weeks. You should lose 2 to 4 pounds in the first 2 weeks. Once weight loss stalls, you can drop the calories to 1750 calories and continue for a few more months. This will allow weight loss to continue much longer than if you had started at 1750 calories. Having a snack between meals can help prevent overeating during your main meals. But a snack needs to be small. It’s not an extra meal. And like I mentioned above, when you snack you need to decrease the portions of your regular meals. If you’re looking for great snack ideas, get our Summer Recipes e-book by entering your name and email below.